We&apos;ve searched far and wide, through Africa&apos;s deserts and jungles, cities and wildlife reserves, islands and mountains, to uncover the continent&apos;s most inspirational dwellings; our goal was to find the kind of interiors that defy description, and we think the results will definitely leave you speechless. Nestled within these pages you&apos;ll find lush modern homes mingling with mud huts, funky artists&apos; studios, elegant lodges, minimalist houses, ornate traditional homes, townships and much more - all lovingly built and decorated with sensitivity, creativity, craftsmanship, individuality, and sensuality. 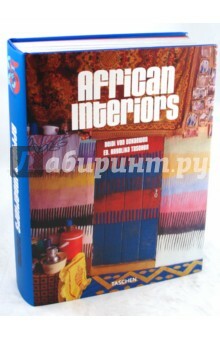 African Interiors captures the beauty and diversity of African living. Countries featured: Benin, Botswana, Burkina Faso, Cameroon, Egypt, Ghana, Ivory Coast, Kenya, Mali, Mauritania, Mauritius, Morocco, Niger, Nigeria, Senegal, Seychelles, South Africa, Tanzania, Togo, and Tunisia. About the editor: Angelika Taschen studied art history and German literature in Heidelberg, gaining her doctorate in 1986. Working for TASCHEN since 1987, she has published numerous titles on art, architecture, photography, design, travel, and lifestyle. About the photographer: Deidi von Schaewen, who has lived in Paris for thirty years, is a contributor to a range of international periodicals and a filmmaker, and has published numerous books. Her publications with TASCHEN include Indian Interiors, Fantasy Worlds, Gardens of Provence, and Inside Africa. Издание на английском, немецком и французском языках.